January 8, 2013.- The electricity demand in 2012 has been mainly determined by the evolution of economic activity. In countries with a more uncertain economic situation, such as Spain and Italy, the electricity consumption in 2012 decreased compared to 2011. In other countries with more stable economic conditions, such as France or the UK, demand for electricity rose or remained constant during the past year. 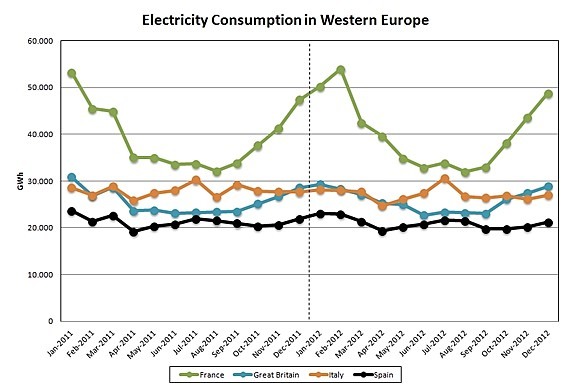 Evolution of monthly electricity demand in Western Europe -2011 and 2012 – (GWh). Electricity demand in Spain in 2012 has decreased by 1.7% from year 2011. Inter-annual demand evolution has been negative in the four quarters of the year. Despite the increase in February due to the cold snap that covered the continent, the demand during the first quarter decreased. With the same trend, the annual gross domestic product dropped (still provisional data) by 1.6%. Similarly, the electricity demand of Italy fell in every quarter of 2012. The total annual demand decreased by 3.0% over the previous year. At the same time, according to provisional data, the Italian economic activity decreased by 2.2%. In the case of France, the electricity demand in 2012 was 1.9% higher than in 2011. In this country the increase in demand was stimulated by the cold snap in February and a stable economic situation in which GDP expanded by 0.1% in 2012, according to provisional data. In Great Britain, electricity consumption has remained relatively stable and closed year 2012 with a slight increase of 0.4% over the previous year. This stability of the electricity demand is consistent with provisional data indicating that, during 2012, the UK GDP felt by 0.2%. 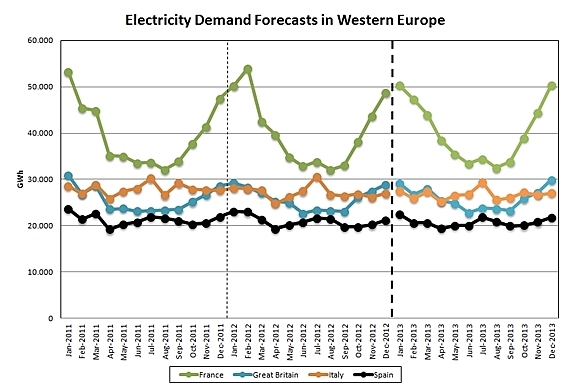 Demand forecasts in Western European countries are still determined by economic activity forecasts. 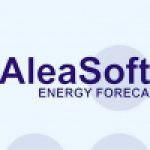 According to AleaSoft forecasts, electricity demand will grow in France and Britain in 2013, while it is expected to decrease in Spain and Italy. Electricity demand forecasts in Spain for 2013 show a decrease of 1.2%, using a scenario where GDP forecast shows a decrease of 1.4%. In the case of Italy, electricity consumption is expected to decline in 1.2% during 2013. This forecast is based on a GDP scenario in which the Italian economy decreases by 0.8% in 2013. Electricity demand in France for 2013 is expected to be 0.4% higher than last year. Demand forecasts have been made taking into account a GDP growth of 0.4%. In Britain, electricity demand is expected to grow by 0.7% in 2013, based on a GDP growth scenario of 1.1%.